What a time to be alive and eating through L.A.’s pizza scene. Respectable New York-style, Chicago-style, Neapolitan, and even Roman-style pizza can be found from Northeast L.A. to the Valley. In addition to more traditional varieties, there’s some batshit crazy stuff happening with pizza toppings in shops around the city. At the moment, the most delightfully bizarre pizzas can be found at Koreatown Pizza Company (3881 Wilshire Boulevard). Their specialty pizza menu is a long list of hybrid variations that’ll make you go “LOL WUT?” We tried all of KPC’s specialty pizzas, creative crusts and all. Yup, some of the topping combos are curious, but we enjoyed the adventure. It’s customary for every pizza place to have a white pizza, and Abel’s Chicken Alfredo is KPC’s version of that. 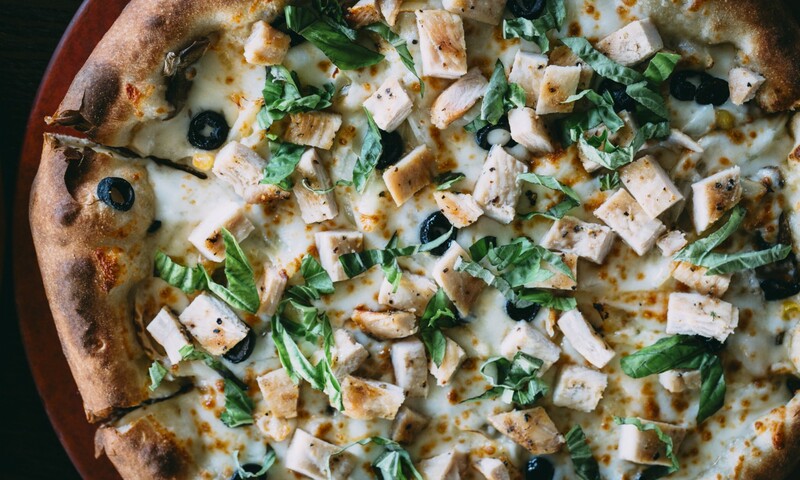 It’s topped with chicken breast, corn, olives, mushrooms, onions, mozzarella, Alfredo sauce, fresh basil, and a cheese-stuffed crust. It’s commendable by any other pizza joint’s standards (the fresh basil is divine), but we were really looking for more of a WTF-factor for this list. The Golden Potato pizza is topped with potato wedges, big slabs of bacon, ground beef, tomato sauce, mozzarella cheese, corn, onion, mushrooms, and sour cream. It’s basically a deconstructed and then reconstructed baked potato plus ground beef and bacon. Our favorite part of this was the irresistible crust. 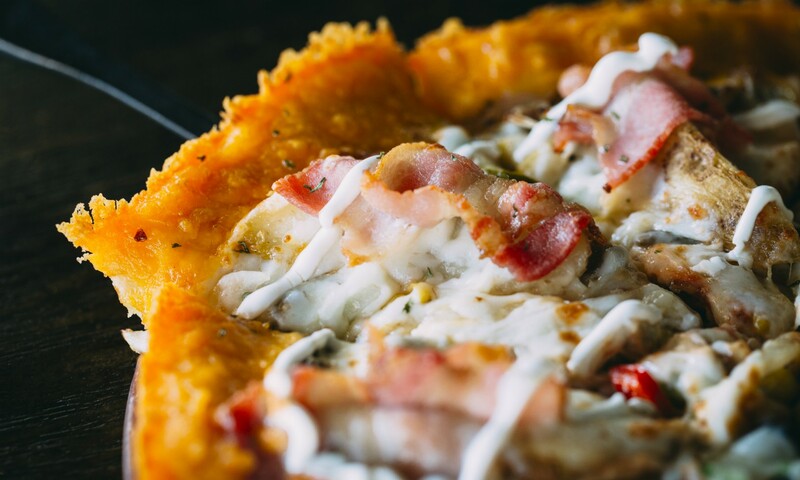 The Gold Crust is stuffed with sweet potato and topped with a crispy cheddar cheese. It’s so good, you might end up eating this slice backwards. If you think pineapple is the most offensive pizza topping, then A.) you might as well stop reading this right now and B.) please excuse us while we take a bite of this delicious slice. The Sweet & Savory is really more sweet than savory. Think of it almost like a dessert pizza. It’s topped with pineapple, sweet potato, dried cranberries, almond flakes, streusel, corn, condensed milk sauce, Emmental cheese, and a sweet and creamy custard crust. It’s not a surprise that the flavors of surf and turf work well together. We were surprised, however, by one topping—a swirl of ranch dressing. But somehow it works. 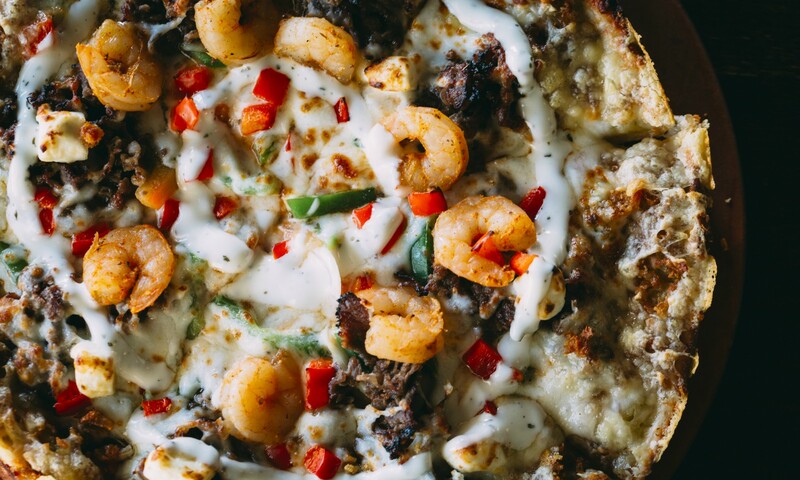 This pie is also topped with rib eye, Cajun shrimp, bell peppers, onions, cream cheese, Emmental cheese, and has a crust that’s stuffed with sweet potato and topped with crispy hashbrowns. This pizza is cheesy and meaty, and has a nice drizzle of tangy ranch, which you can request on the side if you’re dubious. This one is another iteration of the “Golden” pizza featuring that magical gold crust. 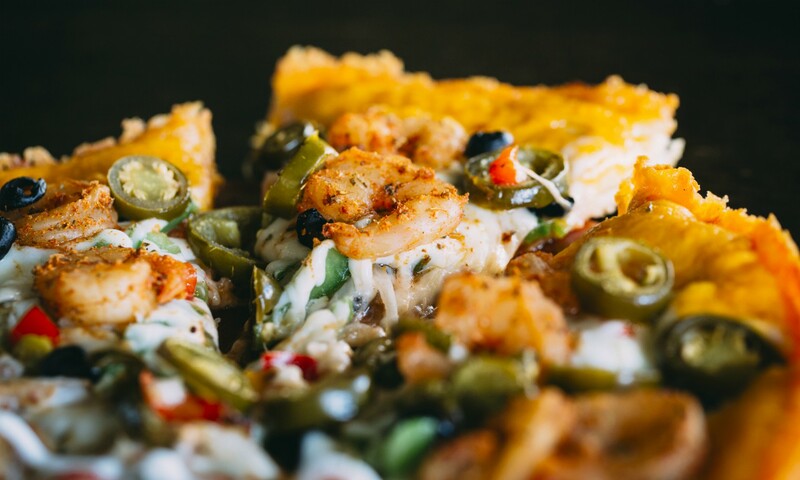 The Golden Shrimp is topped with Cajun seasoned shrimp, sweet chile sauce, mozzarella, corn, mushrooms, onions, bell peppers, olives, and jalapeños. The sweet chile sauce, jalapeños, and Cajun seasoning give this a sweet heat that kept us going back for more. 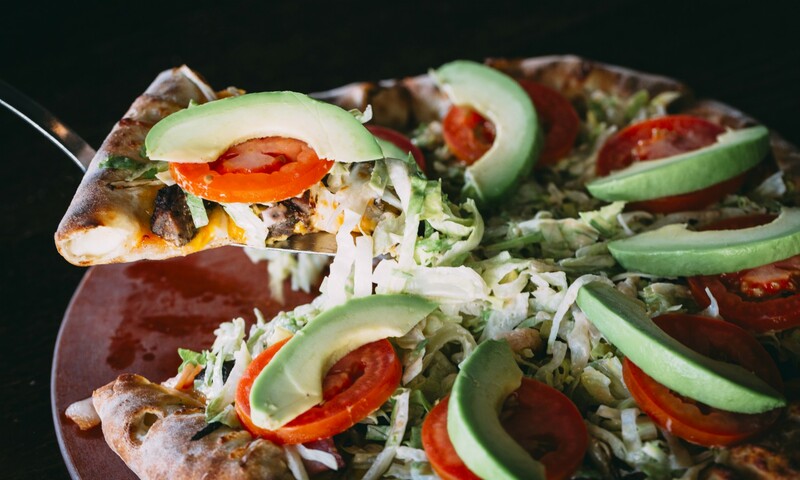 There’s a taco pizza because, well, of course there is. 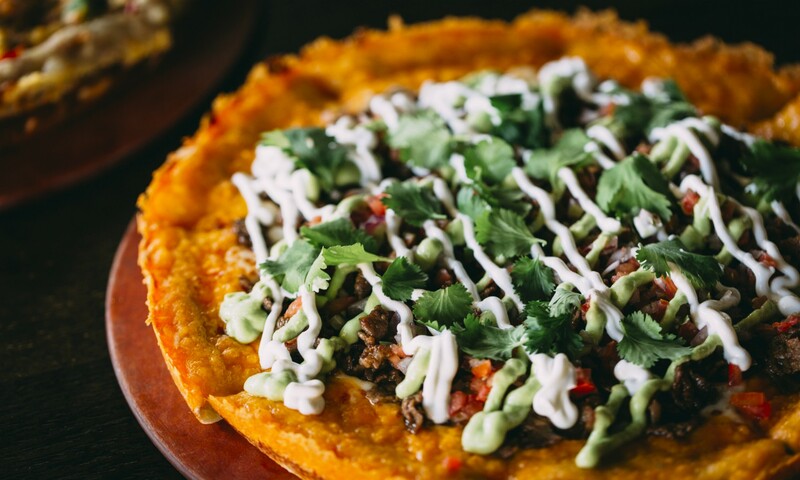 It’s topped with carne asada, jalapeños, bean sauce, cilantro, a drizzle of sour cream, a drizzle of guacamole (that doesn’t cost extra), and a gold crust. The Mexican flavors make it feel like an oversized open-faced burrito. 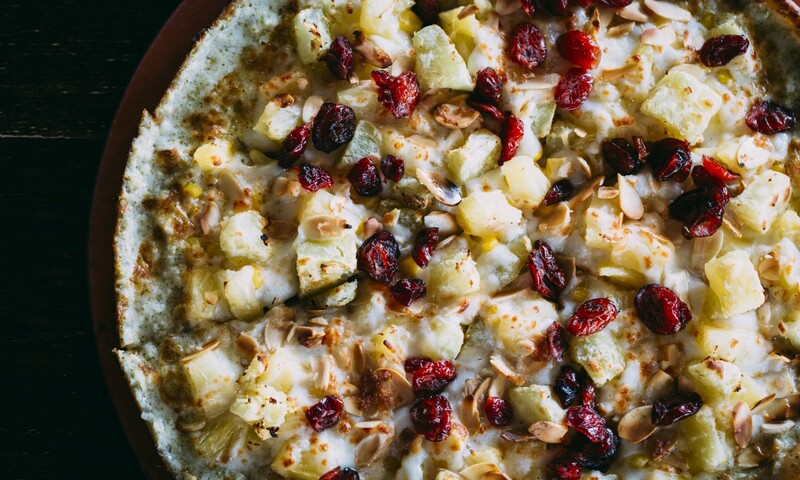 When this pizza comes to the table, the aroma of a big sweet cookie slaps you in the face. 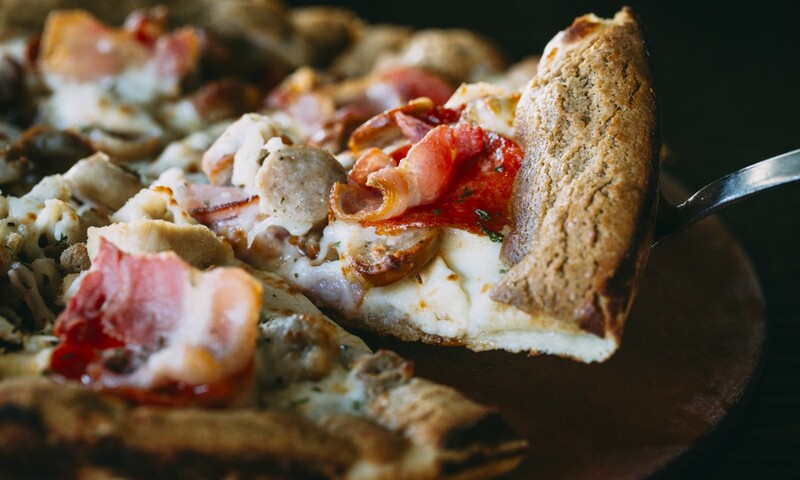 Though the Meatheads pizza is piled high with meat and cheese (Italian sausage, chicken, ham, pepperoni, ground beef, bacon, and mozzarella), the crust is mocha flavored and stuffed with cream cheese, and it gives off the scent of a freshly baked mocha cookie. Yeah, we’re aware that it sounds like a strange combination. But think of it like you’re getting free dessert with your meat lover’s pizza. It’s really a bargain considering how yummy this crust is. 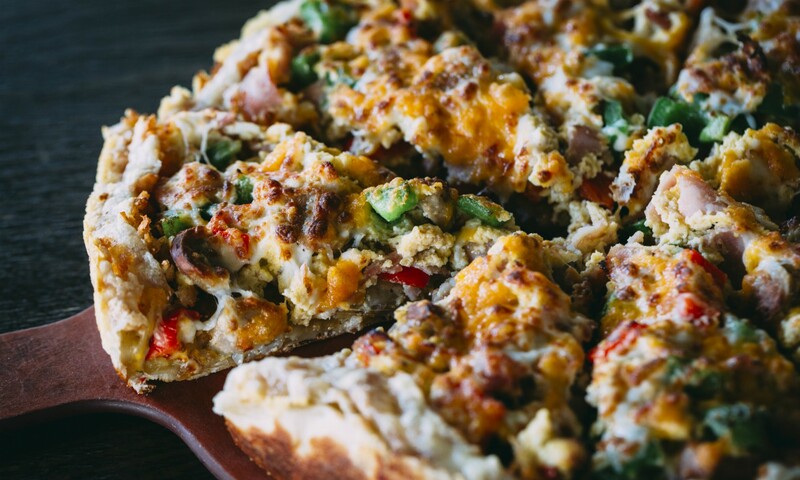 By the way, KPC serves all-day breakfast, in pizza form. The Morning Glory is made with scrambled eggs, bacon, sausage, ham, cheese, bell pepper, layers of hashbrowns and a hashbrown crust. It feels more like an omelette surrounded by hashbrowns than an actual pizza. They go pretty deep with the hashbrowns and it can make the pizza feel heavy, but we’re not ones to shy away from a hearty breakfast. You probably won’t finish the whole pie on the first go, so take it home and enjoy round two the next day. Pro tip per the kitchen staff: this pizza is best with added sriracha. Out of all the specialty pizzas, the Golden Greek pizza felt the lightest of them all. 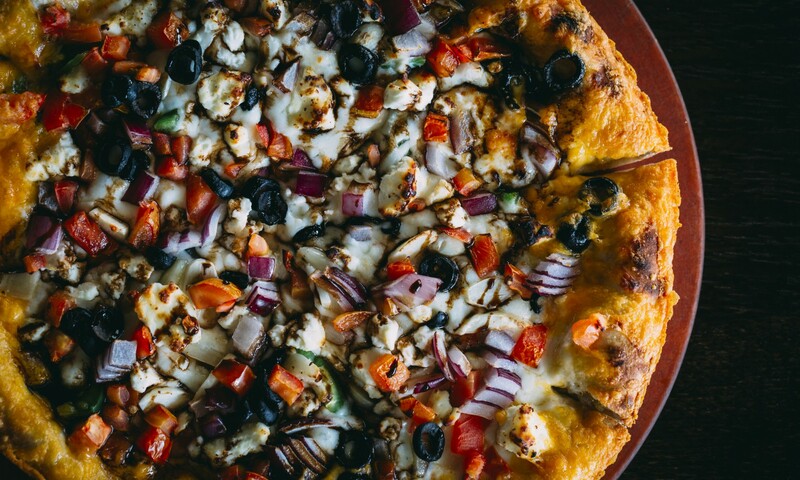 It’s topped with tomato sauce, feta, red onion, garlic, bell peppers, tomatoes, olives, arugula, balsamic vinegar, and has a gold crust. The balsamic is tart, the feta is tangy, the bell peppers are sweet, and everything tastes super fresh and balanced. The Patty Cake is a cheeseburger on a pizza. It’s topped with burger patty chunks, grilled onions, cheddar and American cheese, Thousand Island-tossed lettuce, tomato, and avocado, all on a cheese stuffed crust. It tastes a lot like cheeseburger from In-N-Out but with bacon. We’ve always dreamed of a Double-Double with bacon. It wouldn’t be “Koreatown Pizza Company” without a Korean barbecue pizza. The Kingsley has everything you need for a real KBBQ experience—meat, banchan, and all—but on a pizza. There are two versions of this pizza: regular and spicy. We recommend the spicy version (“The King”). It has the same toppings as the regular version but it packs heat. It’s topped with marinated beef, tomato sauce, onions, bell peppers, mushrooms, mozzarella, and corn cheese, with a gold crust. 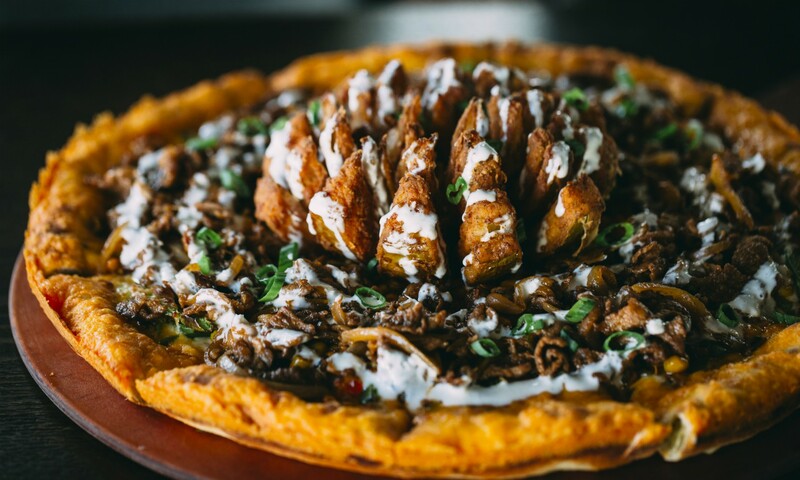 And because every king needs a crown, there’s also a fried onion crown on this pizza. This pizza is beyond extra. The spicy, meaty, and sweet flavors are intense. Besides being super tasty, the Kingsley is a lot of fun to eat. How can you not enjoy pulling apart an onion blossom? Don’t act like you’ve never put spaghetti on bread before—or at least wanted to. 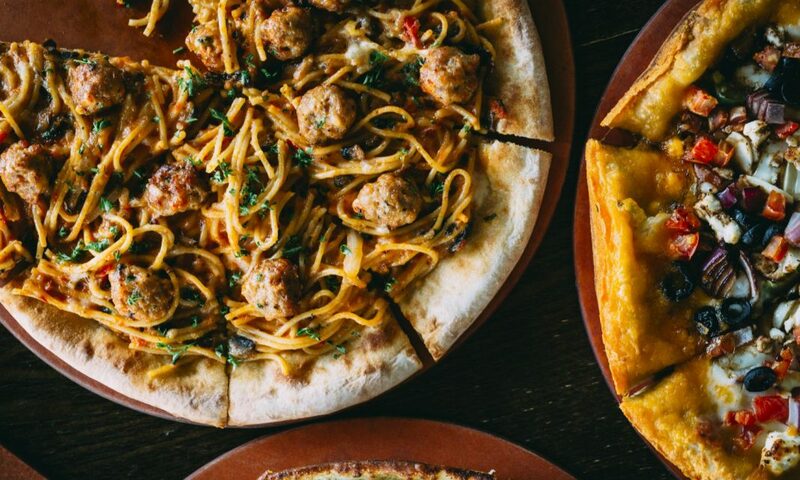 Our favorite pizza, the Lady and the Champ, is essentially a big bowl a pasta on top of a giant piece of bread. This is the only pizza that doesn’t have a special crust because that’s not crust, those are just breadsticks that come with your pasta. It’s topped with spaghetti, meatballs, and a mildly spicy tomato and an Arrabbiata-like sauce. 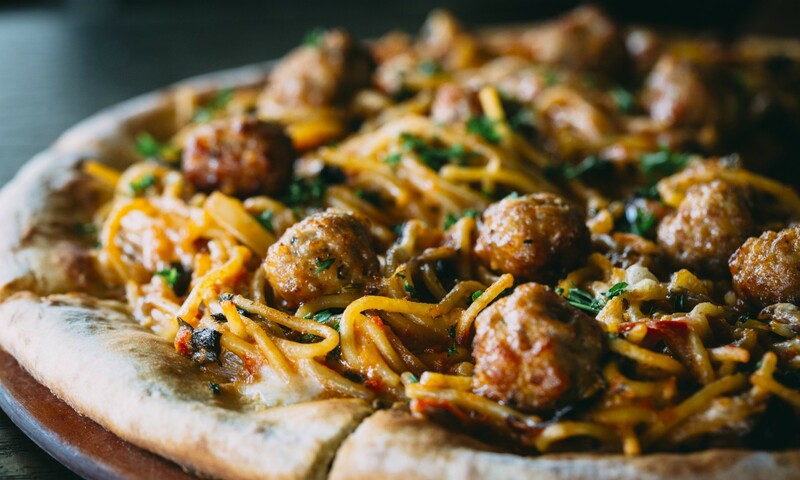 It combines two of America’s favorite dinners, spaghetti and pizza, in one mouth watering, flavorful pie. RELATED: Roman-Style Pizza Is a New L.A. Trend—But What Is It Exactly?